A eukaryote (or eucaryote) is an organism with a complex cell or cells, in which the genetic material is organized into a membrane-bound nucleus or nuclei. Eukaryotes comprise animals, plants, and fungi—which are mostly multicellular—as well as various other groups that are collectively classified as protists (many of which are unicellular). In contrast, prokaryotes are organisms, such as bacteria, that lack nuclei and other complex cell structures and are usually unicellular. Eukaryotes are considered to share a common origin, and are often treated formally as a superkingdom, empire, or domain. 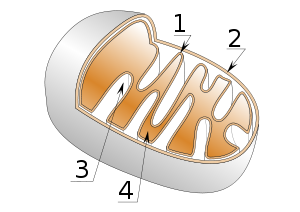 The name comes from the Greek ευ, meaning good, and κάρυον, meaning nut, in reference to the cell nucleus. The evolution of eukaryotes is postulated to have occurred through a symbiotic relationship between prokaryotes, a theory called endosymbiosis. According to this theory, mitochondria, chloroplasts, flagella, and even the cell nucleus would have arisen from prokaryote bacteria that gave up their independence for the protective and nutritive environment within a host organism. Analogous to the symbiosis between algae and fungi in lichens, this process would have conferred a tremendous adaptive advantage upon the combined organism. This type of evolution would be far more powerful and far-reaching than the conventional process whereby change occurs in small increments due to accumulated mutations. The fact that the cells of protozoa, algae, fungi, plants, and animals are eukaryotes, combined with the evolutionary connectedness of eukaryotes and prokaryotes, reveals a commonality of all life—a connectedness from the simplest organism on the microscopic level, with a rudimentary ability to sense its environment, to the complexity of the thinking and loving human being. The origin of the eukaryotic cell was a milestone in the evolution of life, as it led to the development of so many complex, multicellular organisms. It is believed that all life originated from a single, primordial cell more than three billion years ago that out-reproduced its competitors (Alberts et al. 1989). The key landmark was the transition from prokaryote cells to eukaryote cells. The timing of this series of events is hard to determine. Knoll (1992) suggests that eukaryotes developed approximately 1.6-2.1 billion years ago. Fossils that are clearly related to modern groups indicate an evolutionary beginning of around 800 million years ago. Ribosomal RNA (rRNA) trees (diagrams meant to convey some evolutionary history), constructed during the 1980s and 1990s, left most eukaryotes in an unresolved "crown" group, which was usually divided by the form of the mitochondrial cristae (inner folds of membrane). The few groups of eukaryotes that lack mitochondria branched separately, and so it was believed that the two groups (those with and those without mitochondria) had diverged very early on in the evolution of eukaryotes. However, this belief is now considered an artifact of long branch attraction (a source of error in phylogenetic trees) and the eukaryotes lacking mitochondria are now considered to have diverged secondarily as a result of mitochondrial endosymbiosis (Germot, Philippe, and Le Guyader 1997). The Endosymbiotic Theory, proposed in 1967, by Lynn Margulis, is now widely accepted and states among other things that mitochondria are the result of cells' endocytosis of aerobic (oxygen-dependent) bacteria. The heterokonts and alveolates may be part of a larger group that is ancestrally photosynthetic, called the chromalveolates, but this remains contented. Otherwise the relationships between the different supergroups are mostly uncertain, and in particular there is dispute about where the root of the evolutionary tree belongs. As a result, the characteristics of the earliest eukaryotes is also widely disputed. Eukaryotes resulted from the complete fusion of two or more cells, the cytoplasm forming from a eubacterium and the nucleus from an archaeon (alternatively a virus). The origin of the endomembrane system and mitochondria are also disputed. The phagotrophic hypothesis states the membranes originated with the development of endocytosis and later specialized; mitochondria were acquired by ingestion, like plastids (organelles involved in photosynthesis in plants and algae). The syntrophic hypothesis states that the proto-eukaryote relied on the proto-mitochondrion for food, and so ultimately grew to surround it; the membranes originate later, in part thanks to mitochondrial genes (the hydrogen hypothesis is one particular version). Nuclear division is often coordinated with cell division. This generally takes place by mitosis, a process where each daughter nucleus acquires the identical chromosome content to the parent nucleus. In most eukaryotes, there is also a process of sexual reproduction, typically involving an alternation between haploid generations, where only one copy of each chromosome is present, and diploid generations, where two are present, occurring through nuclear fusion (syngamy) and meiosis. There is considerable variation in this pattern, however. Eukaryotes have a smaller surface to volume area ratio than prokaryotes, and thus have lower metabolic rates and slower rates of reproduction. In some multicellular organisms, cells specialized for metabolism will have enlarged surface areas, such as intestinal vili. Eukaryotic cells are generally much larger than prokaryotes, typically a thousand times by volume. They have a variety of internal membranes and structures, called organelles, and a cytoskeleton composed of microtubules and microfilaments, which play an important role in defining the cell's organization. Eukaryotic DNA is divided into several bundles called chromosomes, which are separated by a microtubular spindle during nuclear division. In addition to asexual cell division, most eukaryotes have some process of sexual reproduction via cell fusion, which is not found among prokaryotes. Detail of the endomembrane system and its components. Many eukaryotes have slender motile projections, called flagella when long and cilia when short. These projections are involved in movement, feeding, and sensation. They are entirely distinct from prokaryotic flagella. They are supported by a bundle of microtubules arising from a basal body, also called a kinetosome or centriole, characteristically arranged as nine microtubule doublets surrounding two singlets. Interactions between the microtubules cause the cilia and flagella to move. Flagella also may have hairs or mastigonemes, scales, connecting membranes and internal rods. Centrioles are often present even in cells and groups that do not have flagella. They generally occur in groups of one or two, called kinetids, that give rise to various microtubular roots. These form a primary component of the cytoskeletal structure, and are often assembled over the course of several cell divisions, with one flagellum retained from the parent and the other derived from it. Centrioles are also associated with the formation of a spindle during nuclear division. Some protists have various other microtubule-supported organelles. These include the radiolaria and heliozoa, which produce axopodia used in flotation or to capture prey, and the haptophytes, which have a peculiar flagellum-like organelle called the haptonema. Eukaryotic cells include a variety of membrane-bound structures, collectively referred to as the endomembrane system. Simple compartments, called vesicles or vacuoles, can form by budding off other membranes. Many cells ingest food and other materials through a process of endocytosis, where the outer membrane invaginates and then pinches off to form a vesicle. It is possible that most other membrane-bound organelles are ultimately derived from such vesicles. The nucleus is surrounded by a double membrane (commonly referred to as a nuclear envelope), with pores that allow material to move in and out. Various tube- and sheet-like extensions of the nuclear membrane form what is called the endoplasmic reticulum, or ER, which is involved in protein transport. It includes the Rough ER where ribosomes are attached, and the proteins they synthesize enter the interior space or lumen. Subsequently, they generally enter vesicles, which bud off from the Smooth ER. In most eukaryotes, the proteins may be further modified in stacks of flattened vesicles, called Golgi bodies or dictyosomes. Vesicles may be specialized for various purposes. For instance, lysosomes contain enzymes that break down the contents of food vacuoles, and peroxisomes are used to break down peroxide, which is toxic otherwise. Many protozoa have contractile vacuoles, which collect and expel excess water, and extrusomes, which expel material used to deflect predators or capture prey. In multicellular organisms, hormones are often produced in vesicles. In higher plants, most of a cell's volume is taken up by a central vacuole or tonoplast, which maintains its osmotic pressure. 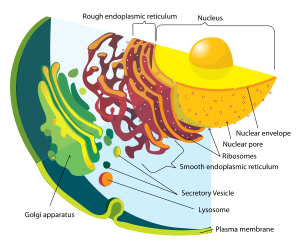 Mitochondria are organelles found in nearly all eukaryotes. They are surrounded by double membranes, the inner of which is folded into invaginations called cristae, where aerobic respiration takes place. They contain their own DNA and are only formed by the fission of other mitochondria. They are now generally held to have developed from endosymbiotic prokaryotes (those living only within other cells), probably proteobacteria. The few protozoa that lack mitochondria have been found to contain mitochondrion-derived organelles, such as hydrogenosomes and mitosomes. Plants and various groups of algae also have plastids. Again, these have their own DNA and are considered to have developed from endosymbiotes, in this case cyanobacteria. They usually take the form of chloroplasts, which like cyanobacteria contain chlorophyll and produce energy through photosynthesis. Others are involved in storing food. Although plastids likely had a single origin, not all plastid-containing groups are closely related. Instead, some eukaryotes have obtained them from others through secondary endosymbiosis or ingestion. Endosymbiotic origins have also been proposed for the nucleus and for eukaryotic flagella, supposed to have developed from spirochaetes (parasitic bacteria). This is not generally accepted, both from a lack of cytological evidence and difficulty in reconciling this with cellular reproduction. Alberts, B., D. Bray, J. Lewis, M. Raff, K. Roberts, and J. D. Watson. 1989. Molecular Biology of the Cell. New York: Garland Publishing. Adl, S. M. et al. 2005. The new higher level classification of eukaryotes with emphasis on the taxonomy of Protists. Journal of Eukaryotic Microbiology 52(5): 399. Baldauf, S. L. 2003. The deep roots of eukaryotes. Science 300(5626): 1703–1706. Germot, A., H. Philippe, and H. Le Guyader. 1997. Evidence for loss of mitochondria in Microsporidia from a mitochondrial-type HSP70 in Nosema locustae. Molecular and Biochemical Parasitology 87: 159-168. Knoll, A. H. 1992. The early evolution of eukaryotes: A geological perspective. Science 256(5057): 622–27. Martin, W., and M. J. Russell. 1992. On the origins of cells: A hypothesis for the evolutionary transitions from abiotic geochemistry to chemoautotrophic prokaryotes, and from prokaryotes to nucleated cells. Philosophical Transactions of the Royal Society. This page was last modified on 21 August 2008, at 19:13.